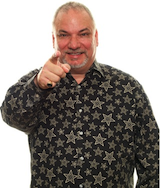 Promotions wizard Doug Harris reveals his original, highly detailed system for developing client-driven, "value-added" promotions while maintaining your station's programming integrity. A former Billboard magazine Promotion Director of the Year and the recipient of dozens of industry accolades, Harris has earned a reputation for out-thinking, rather than out-spending, his competitors in ratings and revenue battles — while demonstrating a unique ability to blend the needs of Programming with those of Sales. Click the button below to add the BUILDING THE PERFECT RADIO SALES PROMOTION by Doug Harris (2-CD audio seminar) to your wish list.